Syrian state TV said on Monday the United States was suspected of striking an air base hours after US President Donald Trump warned of a “big price to pay” as aid groups said dozens of people were killed by poison gas in a rebel-held town. When asked about the explosions, an Israeli spokeswoman declined to comment. Israel has struck Syrian army locations many times in the course of the conflict, hitting convoys and bases of Iranian-backed militias that fight alongside Syrian President Bashar al Assad’s forces. Syrian state TV said there were casualties in what it said was a suspected US missile attack on the T-4 airfield near Homs, which is close to the ancient city of Palmyra in central Syria. “An aggression was perpetrated on T-4 air base in several strikes that is most likely to be an American attack,” state television said in a news flash. A Syrian military source was quoted as saying air defences shot down eight missiles fired at the base. Defence analysts say there are large deployments of Russian forces at the base, and jets fly regular sorties from there to strike rebel-held areas. 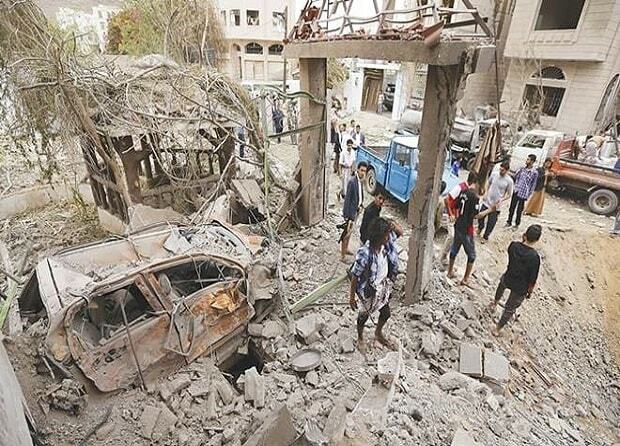 The Syrian state broadcaster said there were several dead and wounded in the strike. The Syrian opposition blamed the suspected chemical attack on Saturday in the town of Douma on government forces. As international officials worked to try to confirm the chemical attack, Trump took the rare step of directly criticising Russian President Vladimir Putin in connection with the incident. Trump said on Sunday there would be a “big price to pay” after medical aid groups reported dozens of civilians, including many children and women, were killed by poison gas in the besieged rebel-held town of Douma. “Many dead, including women and children, in a mindless Chemical attack in Syria. Area of atrocity is in lockdown and encircled by Syrian Army, making it completely inaccessible to outside world. President Putin, Russia and Iran are responsible for backing Animal Assad. Big price to pay,” Trump wrote on Twitter.